Wolves express themselves in many ways. There is the howl-bark, which is usually a distress call. It starts out as a high pitched bark and quickly turns into a short howl. It's a "Wolf Alarm", a warning to pack mates of possible danger. There are the yips, yaps, squeals, and chirps of play. These sounds are also used to show submissiveness to higher ranking pack members. The Wolf Growl is distinctive. It is a very bass sound, which emits from deep inside the animal. It is a warning that should be taken seriously. The Wolf Howl is harmonic. The howl usually shifts pitches to achieve a discord. It is believed that this is done to confuse unwelcome visitors as to the actual size of the pack. It appears that Wolves love a good Howl. I personally have seen wolves stop what they were doing, no matter how involved they were to join in a hearty chorus howl. I have seen them Howl upon awakening, to attract a mate, to let pack members know where they are at the moment and just to send a greeting. While I was working with wolves, I heard them react to sirens with a howl. In the wild, Wolves howl to scare prey, hoping it will come out of hiding. They also Howl when they are distressed by something but not enough to flee. Wolves seem to Howl frequently before a hunt. You can liken this to a human "Sports Rally". 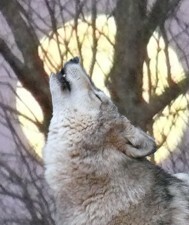 Under ideal weather conditions, a Howl can be heard for up to ten miles away from the source. Listen to Wolf Howl Animal Preserve's Wolves, Watachee, Waya and Ohoyo participating in an evening chorus howl, one of their first! Here is a Midnight howl recorded in January of 2011 during the peak of their breeding season. The deeper howls are from Wa-ta-chee and Waya. The higher pitched sounds are from Woha and Niko Akni. Nita can be heard in a chatter, too. 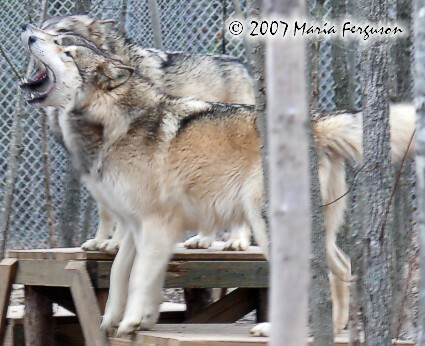 Below is a link to an mp.3 of our Wolves howling, recorded on December 27, 2006. The howl is in response to a coyote that is approximately 2 miles away from the Preserve. If you turn up your speakers, you will hear the coyote in the distance soon joined by a pack of coyotes. Our Wolves howls become frenzied and excited. The Wolf starting this howl is Waya. Breeding season has started, our female, Ohoyo is in proestrus and we've seen wild coyotes coming into the Preserve during daylight hours. We suspect that Waya is communicating with a young female that we've spotted at the edge of the woods. This sound file runs approximately 6 minutes. Woha and Nita howling at 18 days old. Here is a sample of one of our Wolves, Ohoyo in a distress howl, called a "bark-howl". She wasn't happy with the presence of a female visitor at the Preserve. You will hear her speaking to Ohoyo as she distress howls. This is a video link of the bark-howl and may take awhile to load. Here is just an audio sample of the distress howl that will load much quicker. We have recorded a CD of our Wolves howling called, Wolf Songs. If you are interested in hearing 48 minutes of pure Wolf howls, growls and sounds, click here to purchase our Wolf Howl CD. The audio quality is the best digitally recorded howl CD I've heard to date. Three of our Wolves, Wa-ta-chee, Ohoyo and Waya are sharing their songs in the PBS Special, The National Parks: America's Best Idea airing September of 2009 in a six episode series of the fight to preserve the lands and the wildlife. “Very emotional to hear our adopted wolfkids bring their beautiful voices and their history to this fantastic documentary intended to remind people of what is at stake”. Writes Chris Kirby, a staunch supporter of the Wolf Howl Animal Preserve Wolves. "We are proud to be part of this historic recount of the idea to preserve our wild places and the wild animals that inhabit them", says Maria Ferguson, Founder of Wolf Howl Animal Preserve. The series is available through PBS in DVD and Bluray.